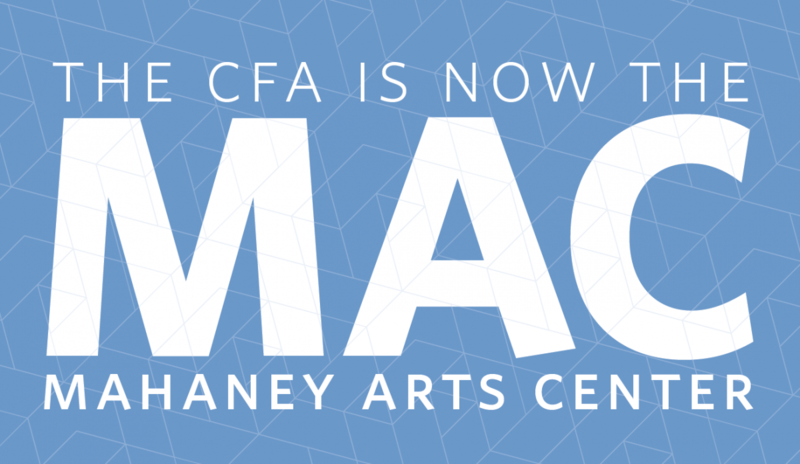 The CFA is now the MAC! Folks who frequent the arts at Middlebury may have noticed the new name Mahaney Arts Center on the website and posters lately. They’re not imagining things—we’ve streamlined our name! Our building has undergone many name changes over its 25-year history. Opened in 1992 as the Center for the Arts (CFA), the building was often referred to as the Center for Fine Arts, or simply the arts center. In 2007, the building was renamed the Kevin P. Mahaney ’84 Center for the Arts, or Mahaney Center for the Arts for short. Not long thereafter, the acronym was adjusted to MCA. Although it appears that way in arts publications and college scheduling applications, it has never really caught on. We still hear the building referred to as CFA and/or MCFA by students, faculty/staff, and community members alike. So let’s clear things up! The official building name is unchanged: Kevin P. Mahaney ’84 Center for the Arts. But our informal, “common” name is now Mahaney Arts Center. Thanks for helping us communicate these changes from here forward…and we hope to see you soon at the MAC! The Mahaney Arts Center hosts 300+ public arts events each year, open to on- and off-campus communities alike. About half of our events are free. Because access to the arts is important to us, we offer many accessibility services to create the best possible experience for all of our patrons. More information at http://www.middlebury.edu/arts.